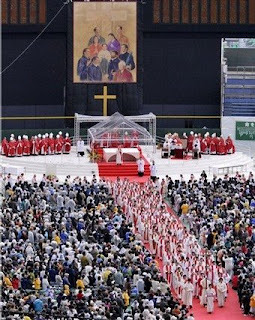 In the largest beatification ever held in Asia, earlier today 188 Japanese -- all but five of them laity (including children) -- killed for the faith in the 17th century were raised to the penultimate honor of the altar at a Mass attended by 30,000 in Nagasaki. Signifying the Vatican's close interest in the event, the Holy See's Saints Czar Cardinal Jose Saraiva Martins made the journey to preside at the celebration, held on a ballfield. They all died 'in odium fidei,"' the Japanese Bishops have said, for defending the right to profess faith in God with a free conscience. The bishops say the beatification of the 17th century martyrs is being seen as a source of inspiration for the Christians of Japan. The 'martyr families' are a reminder that every family, as a domestic church, is called to live and bear witness to the faith. The 188 Japanese martyrs to be beatified are classified in the Canonical Process as "Fr Peter Kibe and 187 companions." They were killed between 1603 and 1639. Peter Kassui Kibe was born in 1587, when Japan still suffered persecutions. In February 1614, an edict declared the closing of all Catholic churches and the internment of all of Nagasaki's priests. Immediately following this act, the priests and laity who led the communities were exiled. Kibe was ordained a priest on November 15, 1620 and made his vows, as a Jesuit, on June 6, 1622. He was captured in Sendai in 1639, along with two other priests. He was tortured for 10 days, and refusing to renounce the faith, was martyred in Tokyo. One of his companions in martyrdom was Michele Kusurya, named 'the Good Samaritan of Nagasaki.' He marched up the 'hill of the martyrs,' located outside the city, singing psalms. He died, as did many of the others, tied to a pole and burned at a slow fire. Among the martyrs, there are 52 faithful from Kyoto, martyred in 1622, and 53 from Yamagata, who died in 1629. One of the most moving testimonies is of an entire family of Kyoto ­ John Hashimoto Tahyoe and his wife, Thecla, martyred along with all their children on October 6, 1619. The Catholics who survived the persecution had to remain in hiding until the arrival of the European missionaries in the 19th century. In an interview leading up to the rites, the city's archbishop thanked the Japanese media for "awaken[ing] interest" in the story and voiced his hope that, for his community, the moment would serve as "an occasion for rediscovering the importance of the faith and of bearing testimony to the love of God." At a press conference on his arrival in the land of the Rising Sun, Saraiva Martins noted that the group "died for their faith - not for economic or political reasons." Estimates of the total number of Japanese Christians put to death in earlier centuries range from 5,000 to 30,000.